Looking for a book about Thailand, I decided to find a book through my trusty source of Amazon and Amazon reviewers. However, I soon encountered a problem – the academic literature which covered Thailand (that did not include Lonely Planet guides and books with questionable titles, such as “How to Get the Most Bang-for-Your-Buck in Thailand”) were few and far between. I found this surprising because Thai culture seems to have hijacked the dining world. Any city (yes, including Spartanburg, South Carolina) will host a plethora of restaurants which feature Thai cuisine. The beautiful beaches of Thailand are the locations for U.S. reality television shows, such as The Bachelor. However, as I searched for an academic book on the country, this question kept on popping into my mind: How can such a country embed itself in the western world as a favorite cuisine, a touristic destination, and a source of fantasy – and still be so far removed from the western discourse and the western thought? I realized that the phenomenon of western detachment and lack of public awareness might be more evident in Thailand than in any other country. One of my go-to movie rentals as a child was the 1956 film, The King and I, an adaptation of the musical by Rogers and Hammerstein. This movie shares the story of the King of Siam, who in the process of modernization of the country employs a British female tutor for his children. 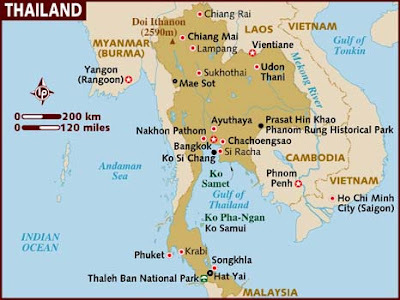 During the era of colonization, the Siamese monarchy attempted to cultivate good ties with the European colonial powers to ensure that it would retain its power over the land – unlike its immediate neighbors, such as Burma/Myanmar. The monarchy was not only able to retain its power in spite of threats from the European powers, but also in spite of manifestations and domestic uprisings with Siam (modern-day Thailand) itself. It was only in the 1930s that Siam changed from an absolute monarchy to a constitutional monarchy. Although Thailand is now nominally a democracy, the king and the elites still wield a great deal of power. 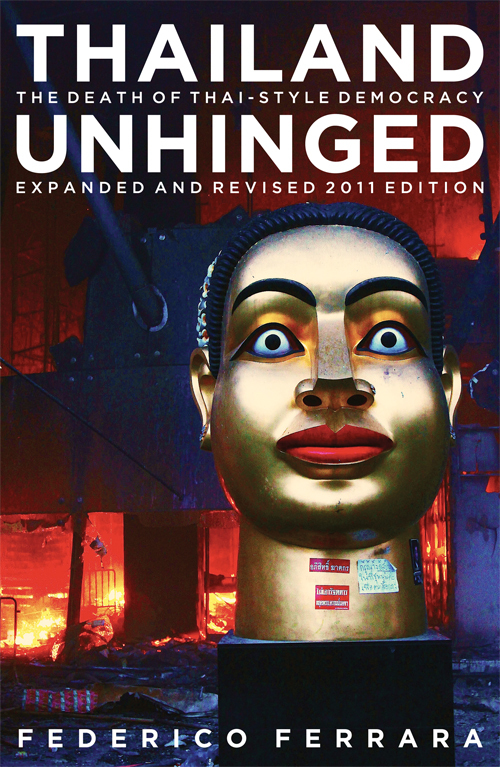 The book which I ended up buying about Thailand, “Thailand Unhinged: the Death of Thai-Style Democracy” by Federico Ferrara, deals with the current political situation in Thailand, as well as the distribution of power, especially in regard to the monarchial system. That being said, I found the book to be somewhat dry (many aspects just flew over my head) and somewhat biased toward one side of the spectrum. The author has an agenda and starts each chapter with a quote from George Orwell’s 1984.) Updated and revised in 2011, it covers the political instability of 2010, in which protestors for governmental change were silenced by the government.